“Breizh” means “Brittany”, so this whisky literally translates into “Brittany whisky” – great name for a whisky from Brittany in France. This whisky improved a great deal after opening the bottle – it changes like a chameleon, shifting its character and improving with every tasting, until finally its true colours shine. Whisky is matured in oak barrels for a reason, and that reason is to enhance its character with oak flavour compounds while at the same mellowing the new spirit which, frankly, is not very pleasant. A lot of whisky from Europe is very young, and it is tainted with the stench of new spirit. 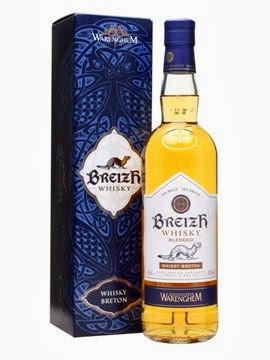 The Breizh whisky from the Warenghem distillery offers a distinctive European style of whisky, but without that new spirit smell or taste – it offers tart fruit, grain, berries, citrus, candied fruit, anise seed and a mild fungal character. Nose: Fresh and light floral notes meet the nose with lush grass and the skin of green grapes and granny smith apples – the fruit is sweet yet tangy, with a sharpness that is mellowed by gentle fungal notes of mushrooms, raspberry and licorice. The bouquet on this whisky is certainly very different, youthful yet complex, and it is very soft and gentle in a pleasant way – a way that will be appreciated by cognac drinkers. There is a sweetness in this whisky that develops over time, once the bottle is left open, and this sweetness enhances the entire experience `- lemon cheesecake with raspberry preserve and sharp passion fruit and the mild aroma of prunes preserved in grappa. This really is quite spectacular. Taste: The sweetness, now candied plums and glazed cherries, softens the sparks of pepper that ignite with sugary papaya as it oozes its juicy sticky nectar. That nectar develops into caramel though which candied orange shines – the presence of orange peel intensifies with lime drops and the drying influence of oak. Finish: The finish on this whisky is sweet and delightfully complex, almost like dark chocolate coated fruit and dried berries. The fungal notes identified on the nose return on the finish, and develop into roasted chestnuts that are glazed with honey. How did this whisky get so good? That answer remains a mystery, but clearly we have a winner!